A quick figure study done last night..Acrylic on canvas. A rustic street in Manavali Village, India. Photo courtesy Ramnath Bhat. 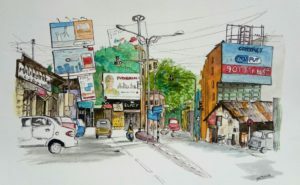 Today morning we at Pune Urban Sketchers did our weekly sketchcrawl at Main Street and MG road, Cantonment area. This smallish junction visible in the picture is in fact a very busy area. It was relatively less maddening today due to Sunday early morning. Done with pen, inks, watercolors and watercolor pencils. A lonely boat near the serene Karwar beach in South India. 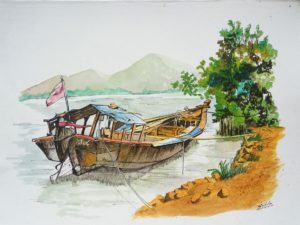 Sketched from a reference photo sent by photographer Ramnath Bhat. A swamp inside a dense jungle. The jungle canopy is punctured at few places to let some sunbeams in. And drenched in those beams is none other than this majestic beast. 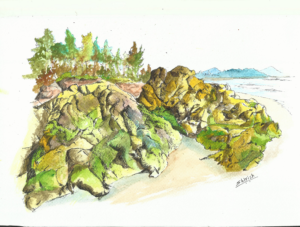 Some rocks at the Karwar beach, from a photo shared by Ramnath Bhat, a fellow urban sketcher. However crowded, ugly or impersonal big cities may get, one cannot deny that their skylines look fabulous when illuminated at dusk. 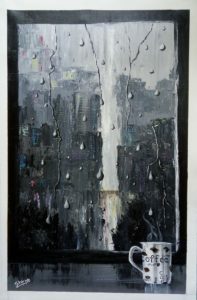 A very wet and rainy day, the soaking big city skyscrapers, a glass window separating the wet, cold world outside and the warm, loving world inside, and of course … a steaming cup of hot coffee. Just add some old time music and a companion to share the memories with! 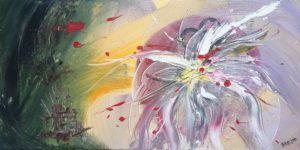 Painted using Acrylics in canvas 20″ X 30″. 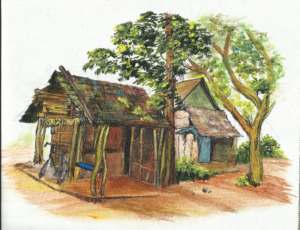 These are few village huts from Ankola, Karnataka, India. 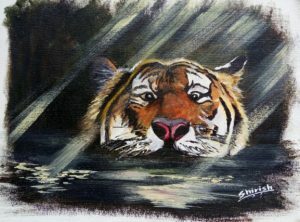 Tried a different combo of Acrylics and Pigma micron pens on canvas (A4 size). 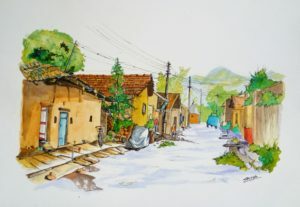 Done off a photo shared by a fellow Urban Sketcher, Ramnath Bhat. 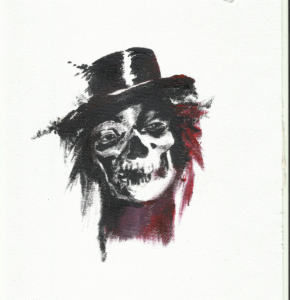 Since some acrylic paint was left, I practiced a bit using them on handmade paper. This is a “trash polka” style tatoo design which I saw on net and copied.